Valentine's Day may be over, but the flavor lingers on with one of the last bottles of the 2013 version of Grimm Brothers Brewhouse annual Valentine's beer - Grimm Brothers The Bleeding Heart Coffee Porter. The city of Loveland, Colorado, (the Sweetheart city) known for their annual special post mark on Valentine letters, also commissioned a special beer just for Valentine's Day. This was the 2nd year in a row that Grimm Brothers made a special brew just for the Hallmark holiday. Last year's batch was a Cherry Porter, but this year Grimm Brothers went in a different direction and made a coffee porter. This beer was only sold in Loveland and was made in a very limited batch. By a day or two after Valentine's Day this beer was not to be seen on store shelves. It sold out very quickly after its release on February 1st, 2013. This brew was sold either on tap or in 22oz bomber bottles. The Bleeding Heart weighed in at 5.2% ABV and had a pink a red label in honor of Valentine's Day. This beer will probably never be made again as each year Grimm will most likely do something a bit different than the year before. Over the last several months, Grimm Brothers has been averaging a special release about once every 2 weeks. Hopefully, this trend will continue and we'll all be able to keep sampling some wonderful small batches of tasty brew. 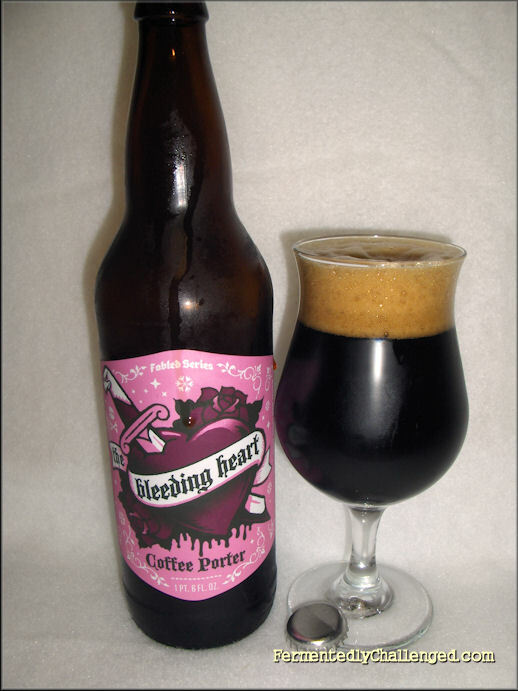 Appearance: The 2013 batch of The Bleeding Heart poured a super dark brown color with a generous light brown head that built up quickly and stuck around for a long time. Held up to the light, hardly any light got through this beer. The brew had a moderate amount of carbonation and there was a slight tan lacing that slid quickly from the glass. Even poured cold, this beer had no problem building up a big billowy head. Aroma: I poured this beer a bit cold and decided to let it warm up a bit first. Good thing as cold tended to mask all the full aromas that came off of this beer. I could pick up a mix of both chocolate and coffee, as well as a generous amount of roasted malt. I could almost swear this smelled like a stout, but this had a bit less dark roast than that. I suggest pouring this beer into either a tulip glass or a snifter-like glass and letting it warm up to about 55 degrees and then taking in a big whiff. That's when the full coffee aroma went into affect. I could also pick up on some of the German hops in this brew as it had just enough earthiness to notice. Taste: This beer is definitely not as thick as a stout, it's slightly lighter bodied, yet has a decent amount of roasted malt and coffee in it without being over the top on either. As the beer warmed, the taste of roasted coffee and a hint of chocolate came through. This was a drier style of beer and had a noticeable bitterness throughout the entire taste. There was just a hint of caramel malt in it, but the bitterness cancelled out any overall sweetness that may have been in the malts. Coffee lovers would definitely love this beer and perhaps it would go as a "breakfast" brew (well definitely an early lunch brew anyway). I'm happy that this beer didn't put in too much coffee as it would have been too acidic otherwise. As it was, it felt like a great blend of malt, coffee and hops. Overall: If it were up to me, I would have put in a hint more sweetness into this brew. When I paired the beer with chocolate covered strawberry jelly beans it became the perfect post-Valentine's Day treat. This was a brew worth drinking and I thank the brewery for giving me a bottle. It seems like Grimm Brothers has been on a roll lately with some winning recipes. I hope they consider making more of this beer someday. Disclosure: This bottle was given to me without charge directly from the brewery. I was not paid for this beer review. - Grimm Brothers Sooty Brother Grätzer Ale review. - Grimm Brothers Little Red Cap review.